(Bloomberg) -- The U.S.’s planned exit from Syria must be gradual or it risks letting the Mideast nation be overrun by Iran, Islamic State terrorists or Kurdish militants, Senator Lindsey Graham said. “I believe it would be an absolute disaster to walk away from Syria and drop in Erdogan’s lap armed elements of YPG that he considers to be terrorist and expect Turkey to deal with that and prevent ISIS from coming back,” Graham, a South Carolina Republican, told Bloomberg in an interview in Ankara. Addressing concerns by Turkey, a NATO ally, over Kurdish militant group YPG can dovetail with American objectives such as containing Iran and the jihadist group Islamic State, he said. The U.S. must stop any Iranian incursion into Syria, a “strategically important country,” he said. The group’s battlefield successes have been a major component of the U.S.-led effort to defeat IS in Syria, and Kurdish militants now control approximately a third of the country. Turkish officials have objected to U.S. support for the YPG, even on a temporary basis, saying that the YPG is simply the Syrian branch of a separatist terrorist organization it’s been battling against for over three decades. For its part, the U.S. has been adamant that its relationship with the Kurdish militia is tactical and temporary and aimed at defeating IS, a task that no other group in Syria can be expected to achieve. American officials also have expressed concern about abandoning Kurds who fought alongside U.S. troops. After a meeting with Recep Tayyip Erdogan that lasted over two hours, Graham said he was determined to take action. “Here is the promise I made to President Erdogan: I’ll try my best to fix the problem we’ve created for your country,” he said. U.S. forces in Syria sustained their deadliest attack in the northern town of Manbij a month after President Donald Trump claimed victory over Islamic State and ordered a pullout of the American military. Four Americans were killed and three wounded. 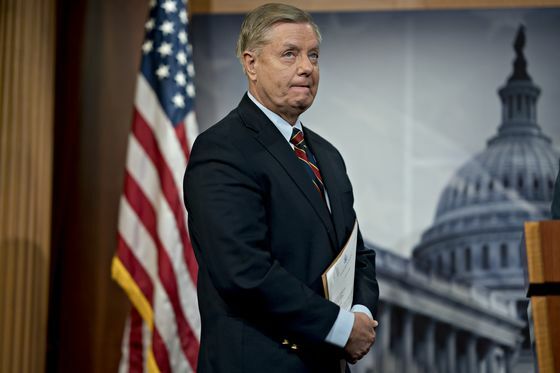 “The road map is to make sure that terrorist elements in the eyes of Turkey are removed from Manbij” and make it safe “for all elements including non-YPG Kurds,” Graham said. Trump’s abrupt decision to exit Syria -- apparently made during a call with Erdogan in December -- stunned most U.S. allies, but was welcomed in Turkey. Yet repeated public calls by Trump’s Secretary of State Mike Pompeo and National Security Adviser John Bolton not to attack “Kurds” stoked tensions between the NATO allies. “Syria is not just death and sand, Syria is a strategically important country in a volatile region,” Graham told Bloomberg. “Our planned withdrawal has to make sure that Iran does not become the biggest winner by us leaving,” a result that would undermine the aim of U.S. sanctions on Iran, he said.